In 1971 a small team of dedicated aviation enthusiasts arranged an air show at North Weald, the famous Battle of Britain airfield, with just over 100 aircraft taking part. Some 40 years later the show is now known as the Royal International Air Tattoo and is, according to its organisers, the biggest military air show in the world. Themes for this year's anniversary edition were STAR 11 (Strike, Attack and Reconnaissance), Tiger 50 (to mark the 50th anniversary of the NATO Tiger Association), and of course RIAT's own 40th Birthday bash. On the basis of the themes announced, and with a rich history of attracting rare participants to the show and flying unique formation flypasts, there were great expectations for the show. Stuart Norris reports from RAF Fairford, Gloucestershire. Photos by the UK Airshow Review team. In an age where armed forces around the world are being stretched ever further and facing huge budget cuts, two headline participants of this year's show came from defence contractors. 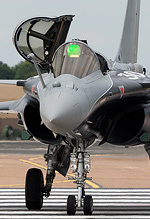 In the absence of an RAF solo, BAe Systems stepped into the breach and provided a Typhoon for the flying display, while CASA sent their 295-AEW, which only made it's maiden flight in early June, to line up in the static park. 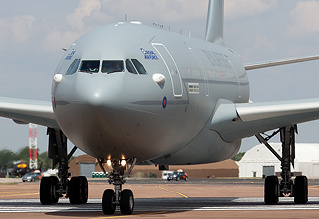 The Royal Air Force's latest aircraft, the Airbus A330, was another attraction at the show worth mentioning. As part of it's appearance, a naming ceremony was held on the Friday afternoon in front of the press to officially christen the type "Voyager". The Tiger theme was well supported with F-16s from Belgium, Mirage 2000s from France and Tornados from Germany all present, wearing attractive and eye catching colour schemes applied for the official Tiger Meet that was held in France earlier this year. It was great also to see them parked with the considerations of enthusiasts and photographers in mind, located as they were in the 'western loop'; a quiet area of the showground with clean backdrops for photography. 'Heavies' included an RC-135V from the USAF and a last minute and most welcome addition was an RAF C-17 Globemaster III from 99 Squadron, based at nearby RAF Brize Norton. Despite heavy operational commitments, the unit were able to provide a specially marked aircraft, which flew into Fairford to take its place in the static park on Saturday morning, departing back to Brize Norton in the evening should it be required for any operational tasking overnight. It wasn't, and the same aircraft returned early on Sunday morning to re-take it's place at the show. Rounding out the noteworthy aircraft to be parked in the vast expanses of the Gloucestershire air base were a couple of real gems in the shape of a Ukrainian Air Force IL-76 and Su-27. Booked by RIAT 'for the enthusiasts' and as part of their 40th Anniversary theme, these were two tremendous additions to an otherwise (by RIAT standards) average list. It wasn't until the Monday departures though that they really set pulses racing and tongues wagging, with the IL-76 blowing two tyres and the Su-27 rolling a short while after the gear had been tucked away. These two incidents caused quite a stir and sparked some interesting debates on social media sites and the UKAR forums in particular. Turning to the flying display, both days were scheduled to have the full eight hours we've become accustomed to at RIAT, with the show scheduled to commence at 10am. However, on both mornings it was raining fairly heavily with a low cloud base which prevented flying getting underway at the advertised time. On Saturday it was not possible for the flying to start until around midday and, with seemingly no flexibility shown, a number of star items were lost from the schedule that day including the 'Solo Türk' F-16 and Saudi Hawks, both of which were UK debutants. The weather improved earlier on Sunday with flying commencing at 11.30. This allowed almost the full flying programme to go ahead, although Patrulla Agulia were the only 'casualty' of the weather, forced to cancel their display as they been on Saturday. The team aren't favoured by everyone, but you have to feel sympathy for them as they remained firmly on the ground all weekend. With that in mind, we'll focus this review on the 'full' Sunday programme, which was opened by the Austrian Saab 105OE in its smart Tiger markings and followed immediately by one of the stars of the show. 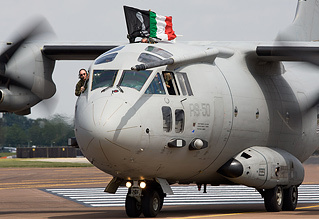 Watching the Italian Air Force's C-27J Spartan, it was hard to believe what you were seeing as this sizeable military transport was flown in an aggressive routine which featured a barrel roll, loop, Derry turn, knife edge pass and the Italian version of the "Khe Sanh" approach. Every manoeuvre earned loud applause from the crowd and fittingly, the crew picked up two awards for a truly stunning display; the 'Sir Douglas Bader Trophy' for the best individual flying display and the 'As the Crow Flies Trophy', as voted for by FRIAT members. The Belgian Air Component provided the first of four F-16 displays of the day, after which the Italian Tornado IDS display showed what the aircraft is capable of when put through it's paces in a traditional display routine. It was a nice contrast to the RAF Tornado role demo that would feature later on. 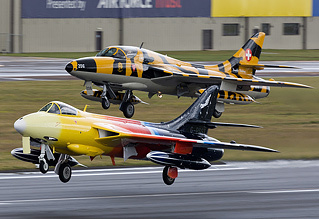 Six Hawker Hunters marked another anniversary, this time the 60th of that particular type, as Team Viper's four aircraft were joined by the Swiss Hunter Team's T68 and Jonathan Whaley's F58A "Miss Demeanour". After two formation flypasts Team Viper went into their display while the colourful pair landed. The Turkish F-16 finally made its UK flying debut and for me was the best of the four 'Viper' displays seen over the weekend. It was a superb routine and was awarded the King Hussein Memorial Sword for best overall flying demonstration, although the pilot's liberal application of right hand rudder immediately after take off didn't look quite as dramatic from crowd centre as it did on rehearsal from 'Park & View'! The Royal Navy Historic Flight's Swordfish was unable to make it to Fairford due to the weather, and with the winds forecast to increase as the day wore on, some quick thinking allowed the Battle of Britain Memorial Flight's Lancaster to fill the slot with a solo display while conditions were still within the Lanc's crosswind limits. Another act making their UK debut then took centre stage as the Saudi Hawks got airborne in their six green Hawks. While not as dynamic as the Red Arrows, the routine did include impressive formation flying, although some of the higher parts of the display were lost in the clouds. A few years back there always seemed to be a 'lazy lunch' section of the show for 45 minutes or so, but a seemingly elongated lunchtime period started with the Dutch Air Force Apache display, whose crew should be praised for making use of the full length of the crowd line, enabling everyone to catch a glimpse of its magnificent paint scheme. The 40th Anniversary of RIAT was marked by the Old Flying Machine Company's warbird pair of Spitfire MH434 and P-51D Mustang "Ferocious Frankie". The significance of this display to the anniversary was the simple fact that MH434 appeared at the very first IAT in 1971, so it was fitting she was part of the flying display this year. It was however a tad disappointing that some sort of unique flypast that RIAT was once renowned for could not have been arranged to mark the occasion, especially considering other UK airshows are always striving to create these 'signature moments'. Indeed, just one weekend prior, at Yeovilton, Vulcan XH558 flew in formation with the de Havilland Sea Vixen. Yet another milestone was marked in the flying display when an assortment of vintage RAF trainer and glider types flew formation flypasts as a tribute to 70 Years of the Air Training Corps. Unquestionably, these lightweight and low powered aircraft were well flown in the blustery conditions, but it's not quite what you conjure up in your mind's eye when you think of RIAT. 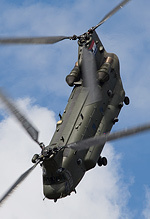 The slow pace continued with the Belgian Air Force Red Devils, RAF Tutor and Tucano and the The Royal Jordanian Falcons, with only the ever impressive RAF Chinook and the Army Air Corps Apache injecting any real life into the display. During this period, the UKAR Twitter feed was full of comments from people beginning to lose interest as the show had slowed almost to a crawl. 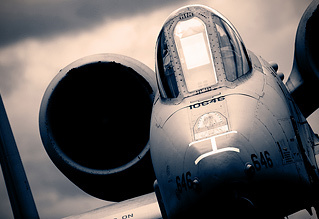 It wasn't until the A-10 took to the skies that it felt like the Air Tattoo had resumed. Thankfully, the USAF West Coast Demonstration Team's Warthog display was mighty, showing the performance of the aircraft as well as simulating strafing and bombing runs. The crowd in turn showed their approval with a huge round of applause as the aircraft landed. Sadly, Saturday's audience didn't get to enjoy the full display, with the aircraft suffering a technical failure just two or three minutes into the allocated display slot, forcing the pilot to abort and return to land. Remarkably, Captain Joe Shetterly left RIAT empty handed after failing to win a single award, despite universal praise from those who had seen the routine on either the Sunday or in pre-show rehearsals. This was the first time an A-10 had been displayed in this country since 2003; let's hope we don't have to wait another eight years before we see it again. A rather lacklustre Dutch F-16 display was followed by the superb RAF Tornado role demonstration, which brought plenty of noise with high speed, low level flying and pyrotechnics. Crowd favourite Vulcan XH558 added even more power and noise to proceedings. This year's routine is the best since her return to the air show circuit. The Red Arrows put on their usual highly slick display before the French Air Force Rafale showed what a fourth generation fighter being flown by a regular Air Force pilot really can do. 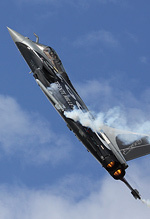 I was unimpressed with the Rafale in 2009, but this display has changed my opinion. The aircraft stayed pretty much inside the airfield boundaries during its display. 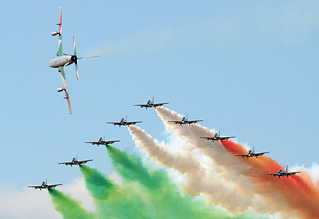 The Frecce Tricolori put on their typically flamboyant show before the BAe Systems Typhoon put on a stunning display with a full weapons load. Attending the show as operational commitments currently prevent the RAF from displaying the Typhoon, BAe Chief test pilot Mark Bowman was awarded the Steedman Sword for his display. 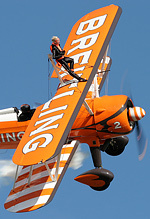 The remaining aircraft to fly on Sunday were the Danish F-16, Spitfire IIa and Hurricane of the BBMF who flew an engaging tail chase routine, with the show closed by the two Breitling teams; the familiar Wing Walkers had an added twist, flying as a four ship for the first time with Breitling sponsorship alongside the French-based Jet Team. They performed a couple of formation flypasts, of sorts, before performing their own routines. All in all the six days I spent at RIAT were very enjoyable, but there are issues that need to be raised, and have been on our forums. We'll be following this report up with an in-depth look at some of the trends and themes that became talking points post-RIAT 2011, but one of the biggest complaints in the pre-show build-up related to the ticket sales policy. 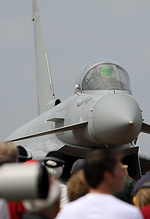 Enthusiasts who attend RIAT year on year tend to book their tickets well in advance, but this year RIAT launched a Father's Day promotion, giving away a free ticket for RIAT 2012 if you purchased a ticket for this year's show. Whatever the reasons for the promotion, the concequences for existing customers seemed a little ill-thought out and the move was seen by many as a snub to those loyal supporters who had already booked well in advance and were unable to take advantage of the offer. Likewise, those attending the Saturday show have been quite vocal at the fact that so many of the aircraft billed as 'stars of the show' in RIAT's own pre-event press releases were allowed to remain on the ground. Poor weather is nothing new in this country and forecasts in the week leading up to the show were pretty ominous, so the lack of flexibility shown on the Saturday running annoyed those who could only attend on that day. They certainly managed to extend and re-organise the Sunday show, which only added to the anger felt by those who held a Saturday-only ticket. Had I only attended the show on Saturday, I'd have felt short changed by what was on offer too. These were probably the biggest talking points from RIAT 2011 and hopefully these points, amongst many others voiced by people after this year's show, will be addressed. They need to be if the show is to be a continued success. 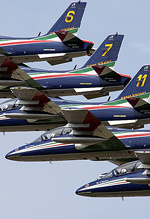 RIAT once prided itself on being arranged by aircraft enthusiasts, for aircraft enthusiasts. People, rightly or wrongly, have increased expectations for next year with Farnborough being held the week after. 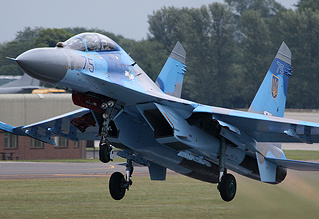 We know that the two shows will work together to try and attract participants and in recent times, a 'Farnborough year' has usually signalled a stronger line-up for RIAT with displays like the F-22 Raptor, MiG-29 OVT and F-18F Super Hornet standing out in the memory. Hopes were also raised by news that a delegation from the Chinese Air Force attended this year's Air Tattoo, showing that RIAT are still looking far and wide for participants, but we'll have to wait and see next year if RIAT still has the X-Factor.